After shooting a video with my Canon HD cam recorder, I get the AVCHD video. Despite that the video is in high definition, I failed to play it in the default media player on my Mac? If I convert the AVCHD video to AVI, will it be playable finally? AVCHD a file format for the digital recording of high-definition video. Ever since Sony and Panasonic jointly introduced AVCHD video format in 2006, it has been widely applied in cam recorder industry, for example, camrecorders manufactured by Canon, Hitachi, JVC, Leica, Panasonic, Sony and more. However, this format has a drawback of bad incompatibility with many mainstream media players. 1. AVI videos are greatly compatible with multi platforms and players, including Mac OS, Window Media Palyer, QuickTime, VirtualDub and VLC etc. 2. AVI format keeps excellent fidelity of the audio. 3. Many choices of codecs are available in the AVI file for experienced user. Given all that, it is advisable to convert AVCHD to AVI to avoid possible trouble. Fortunately, some free Mac AVCHD converter programs can be found on the Internet. 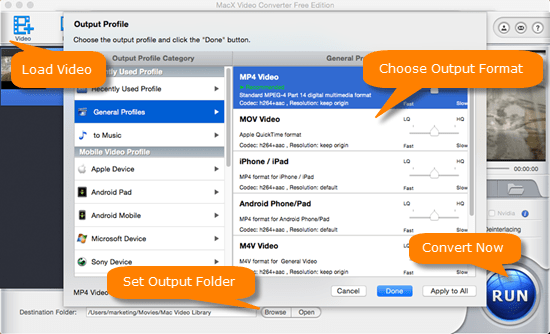 MacX Video Converter Free Edition acts as a good to use software to convert AVCHD to AVI and compress AVCHD file size to AVI with far smaller file size on macOS. It is free and totally clean, while keeping the high video and audio quality reserved during AVCHD to AVI conversion. Meanwhile, this full-featured free Mac video converter can also be used to convert AVCHD camcorder video to MP4, YouTube, iMovie and more. Free download this AVCHD to AVI converter on Mac and run it, then click "Add File" to load the AVCHD files you want to convert. Select the output format you desire. To convert the AVCHD to AVI video, choose "AVI Video" as the output format. You may also customize the video and audio parameters to improve the video quality. After finish the above steps, click the "RUN" button to begin conversion, the free Mac AVCHD converter will automatically helps you convert AVCHD to AVI, and you could view the conversion progress and are able to cancel the converting process at anytime. If you wanna convert AVCHD video to iPhone (iPhone 7/6S/Plus, iPad (iPad Pro, iPad mini 4), iPod, Apple TV 4, Galaxy S8, Sony Xperia ZX, and more handheld devices; download movies to iPhone iPad Android, record Spotify, Grooveshark, Pandora music, etc., please resort to the all-in-one MacX Video Converter Pro to accomplish all the missions just a click away. Convert AVCHD to AVI for Windows Media Player, VLC, Mobiles etc. Free download the free AVCHD video converter - MacX Video Converter Free to easily and fast convert AVCHD MTS M2TS to AVI with high quality reserved for limitelessly watching on WMP, VLC, mobile devices.